The Thai economy is in rude health. The country’s stock exchange is recognised as being one of the most sustainable in the region, while the Eastern Economic Corridor initiative will result in the national government investing approximately $46bn in new construction projects over the next five years. 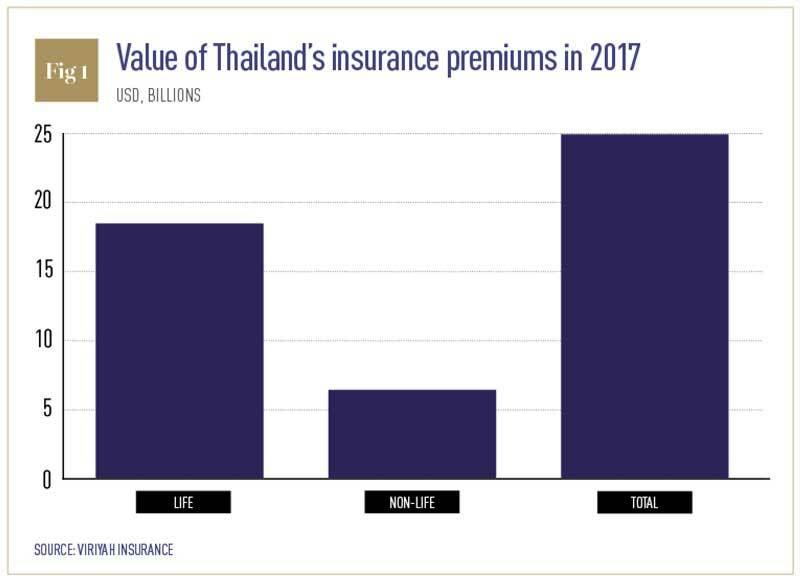 However, among these positive developments, it is easy to forget the crucial role that Thailand’s insurance sector plays within the domestic economy. The Thai insurance industry premium is expected to total around THB 824bn ($25bn) for the entirety of 2017 (see Fig 1), achieving a growth rate of 6.01 percent, the same as in the previous year. Positive trends being seen in the broader economy are also having a knock-on effect. Increased public spending, a booming tourist sector and high rates of private sector consumption are all providing reasons for optimism. Nevertheless, the Thai non-life insurance industry still faced several risks throughout 2017 and beyond. Difficult situations are likely to emerge as a result of a decrease in premium rates compared with an increase in compensation costs. Other risk factors include a lack of preparation concerning internal technological systems and the emergence of newcomers, particularly insurance technology (‘insurtech’) initiatives. That being said, technology provides opportunities as well as difficulties, especially if businesses are flexible enough to introduce and master new tools. World Finance spoke with Pravit Suksantisuwan, Deputy Managing Director at Viriyah Insurance, about the Thai insurance sector and how it is coping with the influx of innovative digital solutions. What are some of the biggest challenges currently facing the insurance industry in Thailand? The biggest challenge facing the insurance sector relates to innovation, but it is one that the Thai Government is well prepared for. A new economic model, called Thailand 4.0, and supporting policies are helping to reform economic structures and propel the nation towards innovation and intellectual development. This will help create a new digital economy that will increase wealth and help make modern technology more accessible for everyone in the country. However, new technologies will also increase pressure on the insurance industry to change. Insurtech firms will introduce new business models and cause the sector to move at an increasingly rapid pace. Therefore, existing insurance businesses will need to adapt and transform their business practices to cope with the coming changes and to meet future customer expectations. How are new technological developments changing the insurance sector? First of all, I think it’s important to recognise just how tech-savvy the Thai people are. With a population of approximately 66 million and internet usage standing at 67 percent, Thailand is home to the 18th-largest online population in the world. Thai people spend a great deal of time using the internet; they average 4.35 hours of browsing every day. Thai citizens are also happy to conduct online research before they make a significant commercial decision. Alongside further developments to Thailand’s internet connectivity, a variety of other technologies are set to spur the digital transformation of the insurance industry. GPS tools, mobile devices and other digital platforms are providing new ways to engage with customers, reduce costs, boost accuracy and improve efficiency. These technologies are also enabling the creation of new insurance services and marketing channels. They are forcing insurance companies to respond to a new era of competition through digital transformation. For instance, insurers can now send notifications regarding the claims process via mobile devices, while motor insurance firms are finding that GPS services are already a crucial part of their business. How is Viriyah leading the way with innovative new digital solutions? Digital transformation is a long and ongoing journey, but one that Viriyah is keen to lead. Our digital capabilities already include the Viriyah Smart Claim (VSC) project, a notification system that helps customers and claim inspectors alike. Our Electronic Motor Claim Solutions (EMCS) project is also being employed to improve repair work efficiency between Viriyah and repair service centres, resulting in greater accuracy, convenience, price control and repair work approvals. This system eliminates the delays caused by waiting for insurance company adjusters to arrive at repair centres and from receiving pre-arranged incorrect spare parts. In addition, the programme also helps to standardise prices and damage assessments, allowing us to control expenses more efficiently. Moreover, the company has introduced a mobile application for agents. The application has been made to enhance work efficiency in terms of mobility, agility and flexibility, and also to reduce operating procedures and associated costs. The most important thing is that partners and employees are ready for everything that accompanies the digital transformation. Are there any regulatory hurdles restricting the introduction of these new innovations? Even though regulations, in many cases, can cause some difficulties, the Office of Insurance Commission (OIC) has prioritised digital innovation within the industry by announcing new electronic insurance regulations. For instance, the digital insurance policy stipulates that both the insurance company and the agent must comply with certain rules relating to insurance proposals, policies and online claims. Furthermore, they must pass security guidelines signed by an external IT auditor before they can obtain a digital insurance licence. Although regulation may increase operating costs and time to market, it can also help prepare insurance companies to propel their business forward more reliably and efficiently. Has the liberalisation of Thailand’s insurance sector hastened the introduction of digital tools? In 2020, Thailand will liberalise the insurance trade alongside the other nine countries in the ASEAN economic community. This means there are only three years left for the OIC to set rules and prepare Thai insurance firms for such liberalisation. Work is already underway, however, and the OIC recently allowed foreigners to hold a 100 percent share in Thai insurance if the organisation meets a minimum capital requirement of THB 4bn ($123m) for life insurance and THB 1bn ($31m) for non-life insurance. With a more liberal insurance industry, availability of increased capital and new technologies will intensify business competition. Thai insurance companies need to be ready to transform their businesses into slick, digital operations in order to survive. How important is mobile technology to improving customer service? Mobile technology plays an important role in improving customer service. This is largely because most people now use mobile phones for almost every activity in their daily lives, including communicating with others, purchasing things online and searching for information. Furthermore, mobile technology provides remarkable channel access capabilities, extending the internet and social media to insurance employees, customers, and partners, and bringing 24/7 communication into the mainstream. Customers can now easily access a company website, communicate via a live chat service, send an email or utilise a mobile app. Certainly, mobile technology is already playing a major role in customer engagement. Could technology introduce new risks into the industry? The digitalisation of the insurance industry could certainly introduce unexpected risks, with the arrival of disruptive technologies, including driverless cars and the Internet of Things, sure to affect the market. Perhaps the most prominent threat comes from cyberattacks, which are causing increasing concern among insurance companies and costing more to prevent. However, new regulations introduced by the government should help insurance businesses become more aware of new issues as we move into the digital era. What role do the other ASEAN nations play in Thailand’s insurance sector? The establishment of the ASEAN Economic Community (AEC) gives Thailand more liberty to expand its insurance sector because of increased international trade. This will boost the number of transport businesses that enable vehicles to cross the border. There will be more hospitals providing better healthcare to the growing number of people living in the areas benefitting from this trade. The sectors that can gain from these developments include motor insurance, carrier liability, health insurance and many others. 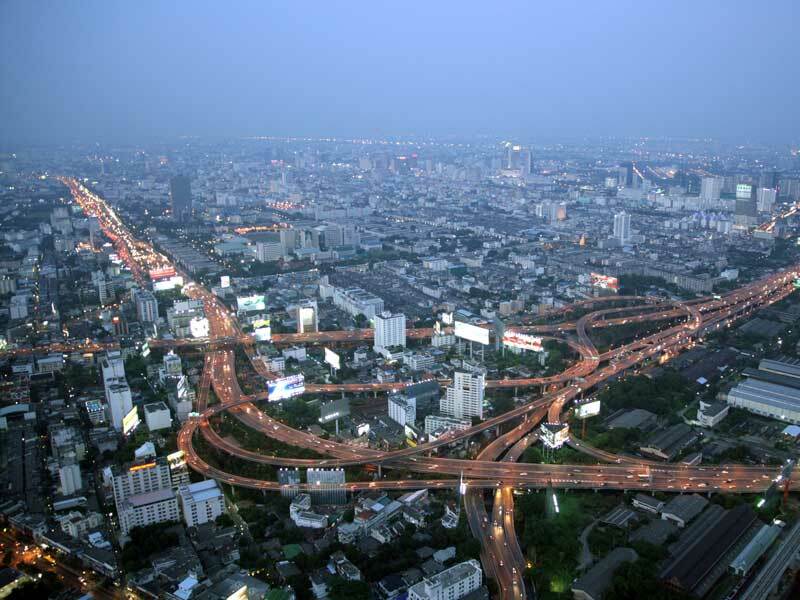 The AEC unequivocally provides more opportunities for Thailand’s insurance sector. What are Viriyah’s plans for the future? Last year marked Viriyah’s 70th anniversary; in that time, the insurance sector has changed markedly. It is also continuing to change, and we have some big plans for the coming months and years. In addition to increasing policy renewal rates, we have set targets to increase the non-motor share of our portfolio from 9 to 10 percent. In doing so, we hope to achieve closer collaboration with businesses and service networks in the medical and health profession within both Thailand and other AEC nations. The V-Total Care Services, a premium health insurance solution, will be developed for customers in the middle and high-income brackets who require higher quality healthcare services. Moreover, the company will expedite the expansion of any insurance projects involving business partners, such as engineering insurance plans, particularly with infrastructure and transport systems likely to provide the principal stimulus for Thailand’s economy over the next few years. More underwriting tools will also be rolled out for use in the personal line category. As a result, individual agents and brokers can proceed with underwriting work themselves more quickly and efficiently. Collectively, these efforts will ensure that fig is not simply another player in the Thai insurance sector, but the real driving force behind many of its innovative developments.